These chicken tenders are moist and tender inside from a quick buttermilk bath, and crunchy on the outside from a surprise breading! Served with a spicy orange dipping sauce, this is a delicious and quick meal! We eat a lot of chicken in our house. I mean, A LOT. Grilled chicken, baked chicken, chicken sandwiches, chicken kabobs, and most importantly, chicken tenders. Both of my sons have loved chicken tenders since they were tiny tots, and my almost 16 year old would easily choose them over most anything for dinner every single night. The trick to chicken tenders is making them healthy and not deep frying them. I mean, I'm all for eating them every day, but not when they've been deep fried! This new recipe is just that, healthy. Oven baked and juicy on the inside, they get a delicious crunchy crust from a surprise breading. Are you ready for this? The tenders are breaded in granola! Golden Girl Original Granola to be exact. Golden Girl Granola is holding a recipe contest for bloggers. We were challenged to make an entree with one of their flavors of granola (I chose the Original), and I thought using the granola like breadcrumbs would be a perfect idea! 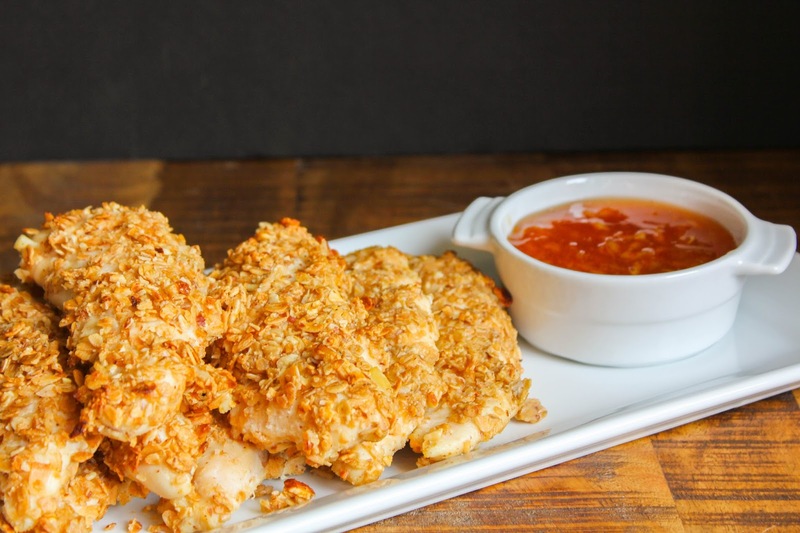 Golden Girl's Original Granola is made with all natural honey, almond slices, and coconut flakes, and gives these chicken tenders the perfect amount of crunch. Golden Girl has 7 different delicious flavors of granola, so be sure to check them all out on their website! You can also find more fantastic recipes there to try out. I made a super simple spicy orange dipping sauce to go alongside my chicken tenders. The flavors were a perfect match for the coconut in the breaded tenders. It's like a tropical vacation for your taste buds! Served with some homemade sweet potato fries, it was a perfect dinner. 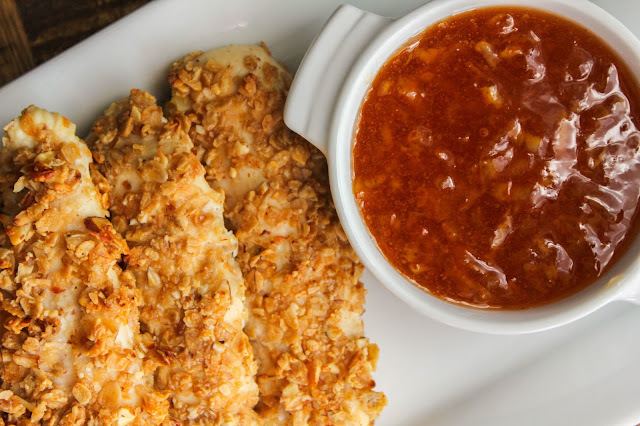 What would you make to go with your crunchy oven baked chicken tenders? Add the chicken tenders and buttermilk to a bowl and toss to coat completely. Cover and refrigerate for 30 minutes to an hour. Add the granola to the bowl of a food processor and pulse 5-6 times. You want crumbles, not powder. Preheat the oven to 400 degrees. Line a baking sheet with foil and place a baking rack on top. Spray the rack with non-stick cooking spray. Place the granola crumbs, salt and a pepper in a shallow bowl and mix. Remove the chicken tenders one at a time from the buttermilk and dredge them in the granola mixture. Place them on the prepared rack on the baking sheet. Bake the chicken tenders for 15 minutes. Remove from the oven and let cool for 5 minutes before serving. While the chicken tenders are baking, make the dipping sauce. In a small bowl stir together the orange marmalade, soy sauce and sriracha. 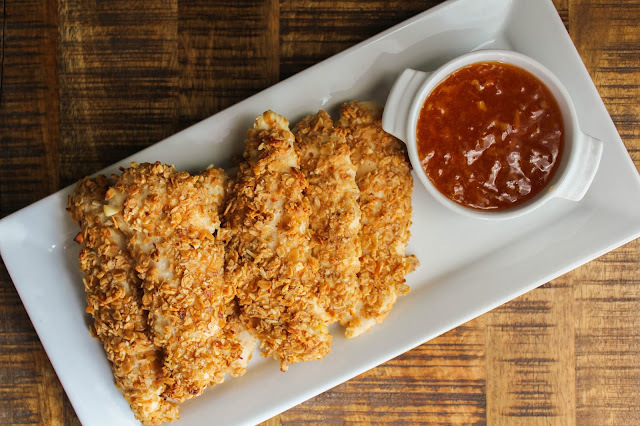 Serve the chicken tenders with the spicy orange dipping sauce. Disclaimer: I received complimentary Golden Girl Granola to create my original recipe for this contest. All opinions, as always, are my own.